I struggled to come up with a title for this recipe. Why? Because there are so many delicious components and flavor profiles that I couldn’t decide on which ones to highlight. First things first, this is a baked oatmeal dish because one of the primary ingredients is oats, and the dish gets cooked in the oven. Baked oatmeal, okay, simple enough. And there’s also sweet potato grated into the oatmeal mixture, so I wanted to include that in the title as well. 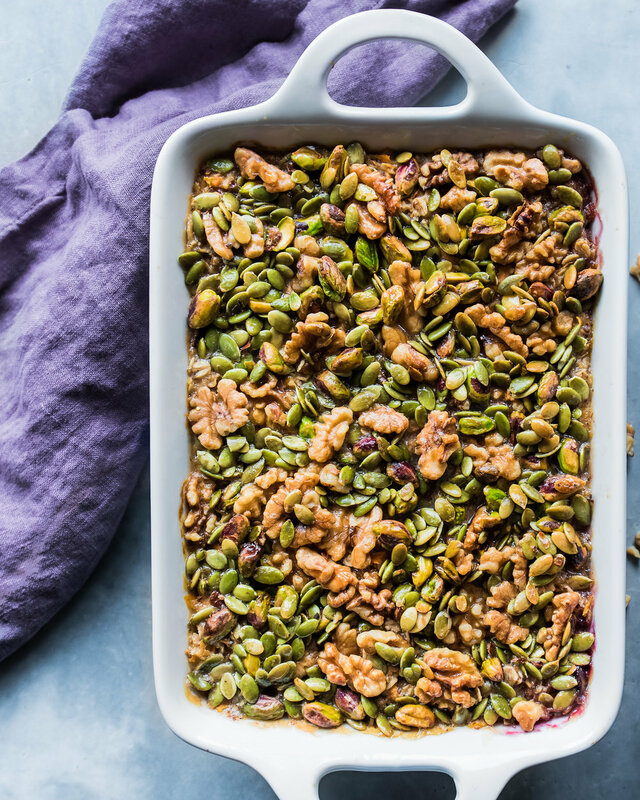 Okay, Sweet Potato Baked Oatmeal makes sense. But what about the cozy spices like ginger and nutmeg that make this a warming winter delight? Or the Medjool dates that lend a sweet taste of indulgence to this oatmeal? Or the raspberry chia jam that sits underneath the oatmeal and imparts each bite with a tart yet sweet juiciness? Or best yet, the sticky, crunchy, and sweet topping that tastes like adult candy? Am I supposed to call this Spiced Date and Sweet Potato Oatmeal with Raspberry Chia Jam and Crunchy Nut Topping? I decided to stick with the simple four-word title instead of the world’s longest recipe title, but I just wanted to give you a glimpse into the very useful, important back-and-forth conversations that take place in my overly crowded brain. Anyways, let’s get back into this sweet, warming, sticky Sweet Potato Baked Oatmeal. Don’t get me wrong, I love my everyday basic oatmeal (it’s actually not that basic because I cook it plant milk + mashed bananas or dates + lots of spices so it’s creamy and warming), but sometimes I get tired of the soft, mushy texture. So I was looking for a way to spice up my oatmeal and add some textural variety. I knew the second I saw this baked carrot cake oatmeal from the the beautiful Green Kitchen Stories blog that I wanted to make something similar. There are a few components to this oatmeal, but each component is really simple to put together. First, there’s the oatmeal mixture, which consists of rolled oats, spices, grated sweet potato, and soft Medjool dates. All you need to do is combine those ingredients together in a bowl, and then mix it with a mixture of plant milk + flax eggs. The combination helps bind everything together in the oven. The next major component is the berry jam. I used this recipe for my Raspberry Chia Jam, but you can use any berry you like. Heck, you could use any fruit jam, fruit compote, or stewed fruit you like (as I type this, I realize that the word “heck” is quite strange and is not becoming on me). And if you’re in a hurry, you can simply dump a bag of frozen berries onto the bottom of the casserole pan instead of making a chia jam or stewed fruit. The final component (and by far, my favorite one) is the sticky, crunchy, and sweet topping that tastes like adult candy. I use a combination of pistachios, walnuts, and pumpkin seeds and then coat them in a sticky mixture of brown rice syrup and coconut oil. If you’ve ever used brown rice syrup, you know that it has an incredibly sticky texture. That makes it the perfect ingredient for this sweet crunchy topping because it almost forms a brittle (hence the comparison to candy). If you don’t have brown rice syrup, your next best bet would be coconut nectar, which is also very viscous and sticky. If you use maple syrup, it will still be delicious but the texture won’t be quite the same. Once you’ve gathered all your components, it’s time to layer the bake. Start by spreading the chia jam (or stewed berries, or a thick layer of frozen berries) onto the bottom of a casserole pan. Then dump the oatmeal mixture on top, and finally, pack in that sweet crunchy topping. This last part is a very messy but fun exercise, and therefore a great (but possibly dangerous) activity to do with children. I’ll leave that decision up to you and your ability to clean a very sticky kitchen. Pop the dish in the oven, and while you wait, inhale the intoxicatingly sweet aroma that will waft throughout your kitchen. Then grab a spoon and serve yourself a hearty serving of this sweet yet tart, chewy yet crunchy Sweet Potato Baked Oatmeal. While this dish is best when it’s served on the same day it’s made, you can also store leftovers in the fridge for up to 2 days. If you try this recipe, be sure to leave a comment below and tag me on Instagram! 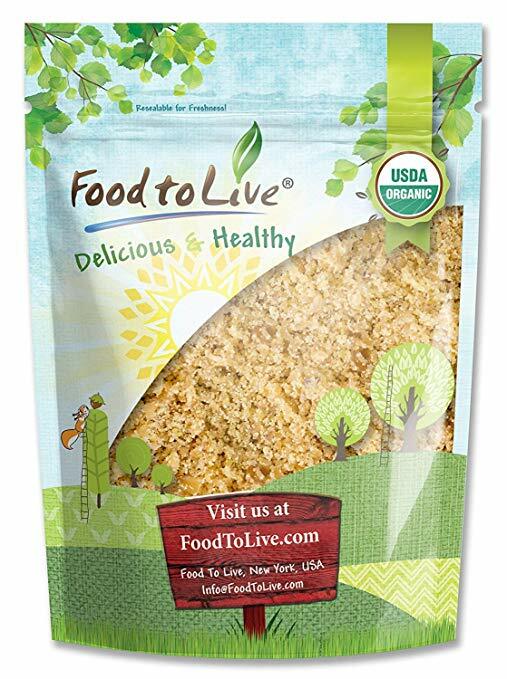 *Combine 2 tablespoons of ground flaxseed meal with 5 tablespoons warm water. Stir to combine and let rest for 15 minutes to thicken. If making the Raspberry Chia Jam, make it first. Heat a small saucepan over medium-low heat and add the raspberries. Cook for 5-7 minutes until the berries are softened and have broken down, smashing down with the back of a spoon or fork periodically. Turn off the heat and add the maple syrup, chia seeds, and orange zest and stir well. Return the heat to low and stir for another 2 minutes until thickened. Turn off the heat and let sit for 5 minutes. Preheat the oven to 375°F (or 190°C). Cover the bottom of a 13x9 inch baking pan (or other 3 liter pan) with the Raspberry Chia Jam (or stewed berries, frozen berries, etc. See the blog post for alternatives). Prepare the flax eggs by combining the 2 tablespoons of ground flaxseed meal with 5 tablespoons of warm water. Stir to combine and let rest for 15 minutes to thicken. Now make the Sweet and Sticky Topping. Measure out 2 tablespoons of room-temperature coconut oil into a medium bowl. Then used the oiled measuring spoon to measure out 4 tablespoons brown rice syrup (using the oiled spoon makes it much easier to pour the sticky brown rice syrup from the spoon). Then add in the pistachios, pumpkin seeds, and walnuts, and stir to combine using a fork or your hands. It’s best to use your hands to ensure all the nuts/seeds get evenly coated, but it is very messy. Prepare the Oatmeal. In a large bowl, mix together the oats, spices, salt, and baking powder,. Using a silicone spatula, fold in the diced Medjool dates and grated sweet potato, using your fingers to break up the dates so they don’t clump together in chunks. in a large measuring cup or bowl, whisk together the flax eggs and plant milk until well combined. Pour half of the milk mixture over the oats-sweet potato mixture and stir to combine with a wooden spoon or silicone spatula. Pour the oatmeal-milk mixture on top of the Raspberry Chia Jam (or stewed berries, frozen berries, etc.). Then pour the remaining milk mixture on top, ensuring that the oatmeal is evenly soaked. Use your hands to evenly arrange the Sweet and Sticky Topping on top of the oatmeal, covering every open spot if possible. Bake the oatmeal casserole in the preheated oven for 35 minutes, or until the sweet and sticky topping is lightly browned.